This place must have looked great on paper when it was being planned. Start with a good assortment of premium sake (a couple dozen nicely chosen brands from around the country), add some trendy shochu and awamori lists (with very respectable selections of each), and a solid, izakaya-style food menu. And why not throw in some popular Okinawan dishes to go with the awamori? Oh, and Spanish cuisine is popular this year - why not add some tapas and Spanish wine to the mix? How could anything go wrong? Unfortunately, in spite of its excellent food and drink, Takara doesn't quite overcome its rather sterile setting in the basement of the Kokusai Forum Building. It desperately needs something. Bamboo blinds? Big plants? Beds of shiny pebbles and running water? Sawdust on the floor? A lighting director? Somehow the atmosphere is just a little too quiet and subdued, the service a little too rote. 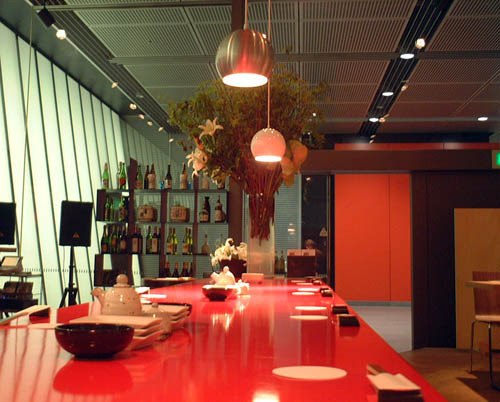 There's a pretty red-lacquer counter, but there's no counterman behind it slicing fish or pouring sake, no focus of attention - it's just a long table stranded in the center of the room. The regular tables and chairs look like they belong in an upscale cafeteria, maybe on a corporate campus. The expensive sound system in the corner plays flamenco music, and it makes you wonder: why flamenco music? For that matter, why tapas? On the plus side, Takara's food is quite good, as is the sake. There's an English-language sake menu that's practically an education in sake appreciation, with detailed tasting notes on each variety (all of which are reasonably priced). In addition to all the other drinks, there's also an excellent microbrew beer fresh on tap - a pale ale from the Fishmarket Taproom brewpub in Shizuoka - perhaps the best beer in this neighborhood. 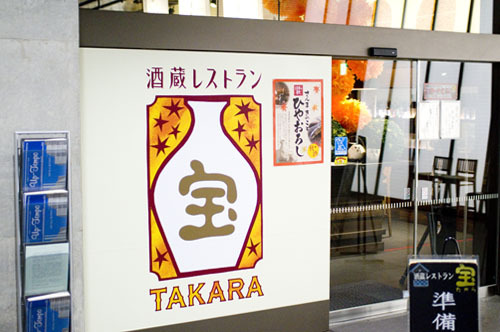 Takara also gives you a rare chance to mix and match cuisines. You can try the Okinawan pork stew with a full-bodied sake instead of a rough awamori. Or try the tofu and yuba dishes with sparkling Spanish Cava, or the Basque-style pintxos with microbrew beer. And the location makes it a convenient place to meet for an after-work or after-concert drink and snack. You may even find yourself settling in for a few hours of food and sake if the mood is right. But you may also find yourself drawn away by the gritty allure of the far more down-to-earth yakitori joints just a few blocks south, under the rumbling tracks of the Yamanote-sen.
Chiyoda-ku, Marunouchi 3-5-1, Tokyo International Forum B1F.